UrBanPerspectiV BLOG: "aHead of the Crowd"
Guess who wasn't really bothered by all the people standing in the crowd? I shot this one at the Wilmington Train Stop of the historic Whistle Stop Tour of President Barack Obama and Vice President Joe Biden. U can view this in a larger size to get the full impact. 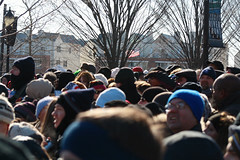 I was kinda envious to see the Head of the crowd with an unobstructed view of the ceremonies unfolding. Imagine the images he could capture with the right lens. Feel free to browse my gallery over there by clicking on the ImageKind button right below this.